A groundbreaking story about a teenage girl who discovers she's intersex . . . and what happens when her secret is revealed to the entire school. 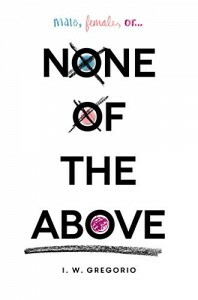 Incredibly compelling and sensitively told, None of the Above is a thought-provoking novel that explores what it means to be a boy, a girl, or something in between. This book was a solid read that was great at explaining a new perspective, but I felt like the only element to it was that Krissy was intersex. I was excited to read this book upon reading the description, and indeed this did a brilliant job of explaining to me what it meant to be intersex and to have AIS. I learned a lot from reading this and was able to experience a new perspective from doing so. It was very sad to see how Krissy's classmates treated her upon discovering her diagnosis, but I found it uplifting to see the unexpected people who reached out to her and who made a difference and showed they care. Seeing how her relationships with various people changed was very telling. However, a lot of the characters felt a little bland--they had potential to be more exciting and more engaging, but they didn't reach it. However, I felt like there were a lot of moments where I wanted this book to have more depth. Krissy was working so hard to show how being intersex was an absolutely normal thing and how she hadn't changed at all, yet the book in a way having few other plot tropes was showing differently. There was a romance, yes, but other than the intersex aspect, this book had very little plot. By the end, she had finally gotten herself together, but I wanted her to put on a brave face earlier. At some points, Krissy really annoyed me because it felt like she did a lot of self wallowing instead of going out and educating the world. But hopefully that comes following the end of this book. I'm really glad this book was written and that I was able to gain a little more understanding from it, but I think there could have been more substance to it.